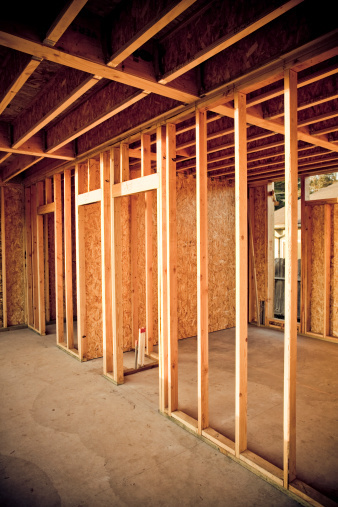 Estimating the number of studs you will need for a given framing project is one of the first steps of building and can be applied to almost any structure. The estimating process is a fairly simple task that grows easier with practice, and is a valuable skill to have in the building industry. Simple tools will help you calculate the number of studs necessary for a wall. Measure a wall on the floor plan from corner to corner using your architect scale at the proper scale factor. The scale factor for the floor plan will be indicated near the page tiltle. Multiply the number of feet in the wall by 12 to calculate the total amount in inches. Divide this number by either 16 or 24 depending on what stud spacing is to be used, and add one additional stud to account for the end of the wall. This will be the number of studs needed for this wall on a basic framing application. Add four additional studs for every opening (windows and doors) in the wall. Repeat Steps 1 through 4 on all remaining walls in the structure. J. Cavan Barry is an architecture student with over a decade of experience in the general construction field, and four years in architecture. Barry also has nearly a decade of automotive repair experience and is an avid auto enthusiast. After finding an interest in creative writing, he began writing a novel and recently finished the first draft.